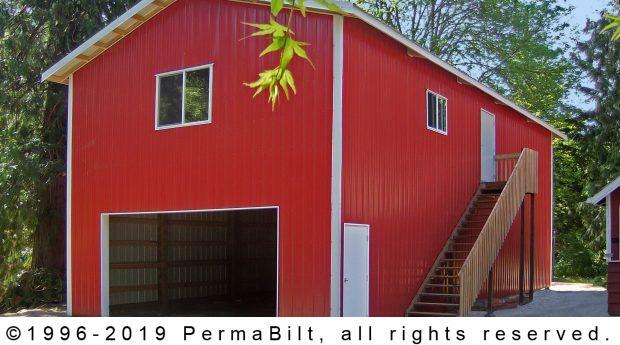 Understanding that erecting a new building is a major investment, many of our customers appreciate that our PermaBilt® Building Representatives are incredibly knowledgeable when comes to post frame construction. Our Olympia Washington customer came to us, he was replacing an existing dilapidated garage on his property and wanted to downsize his building footprint from 1,800 square feet to 1,296. To compensate the customer wanted to add a second floor. Our Building Representative met with our customer three times in working out building size, configuration and accessories that best suited his needs. Now we were ready to deliver. 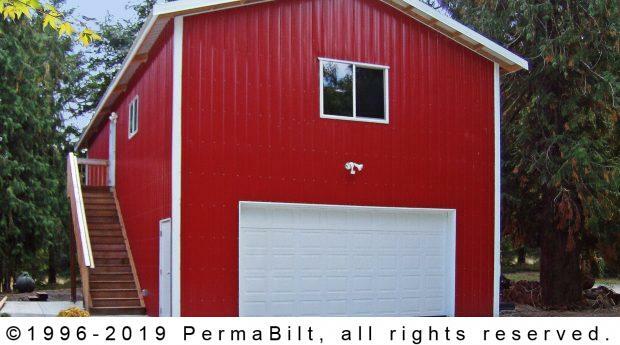 After the site was cleared of the old building, PermaBilt®’s experienced construction crew went to work on his two story garage and shop including adding all the elements he picked out such as his 16’ x 8’ raised panel steel overhead door for strength, security and durability; several walk-in doors with self-closing hinges for added convenience; four foot wide exterior staircase with railing leading to the second story floor which was perfect for his workshop and storage needs; and a concrete pour that included fiber-mesh reinforcement (for added strength and durability) and zip-strip crack-control (which reduced random cracking of the slab). All these elements when put together, gave our customer the building he was really happy with. Knowing how patient and understanding we were at the design stage, gave our customer the confidence that we would build this garage and shop in the manner that was most important to him.